ID: n/a Not Logged In Login Now! Welcome to Bally’s Las Vegas. To describe Bally’s Las Vegas is, in many ways, is to describe Vegas itself. Classic and contemporary, timeless and sophisticated, inviting and charming. 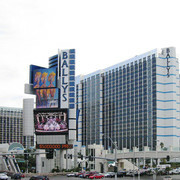 Bally’s is everything that is Las Vegas and so much more.With its prime location on the famous Four Corners of the Las Vegas Strip, Bally’s Las Vegas boasts a prime address at the very center of an amazing array of entertainment options second to none on Earth. The 2,814 guest rooms at Bally’s Las Vegs have been crafted with your ultimate comfort and convenience in mind. Offering amenities usually reserved for only the finest suites, each guest accommodation provides a spacious and stylish retreat where you can focus on business or simply gaze at the amazing view of the Strip below or the beautiful mountains on the horizon. To reserve your room online, please click here. If you prefer to phone in for your reservations, please call the Reservation Center at 800-358-8777. Our group is listed as APA 2019 General Convention and also as Alpha Phi Alpha Fraternity. Callers may also reference our group code to identify the group - SBAPA9. © 2019 Alpha Phi Alpha Fraternity, Inc.. All rights reserved.